The Phillies Nation Top 100 concludes today with #1. Our mission is to assess the Top 100 Phillies players of all time using impact to the Phillies, individual achievement, team achievement, traditional stats, and analytics as our criteria. The list was compiled by Ian Riccaboni and Pat Gallen with input from the rest of the Phillies Nation staff. To view the previous 99 players listed thus far, please click here. To view the 2008 iteration of the list of Greatest Phillies of All Time as compiled by Tim Malcolm, please click here. Michael Jack Schmidt was drafted in the second round of the 1971 amateur draft, a senior-sign out of the University of Ohio. Before Schmidty could play one full season in the minor leagues, Schmidt was called up to be a piece of one of the worst teams in recent Phillies’ history, the 1972 squad. Winning just 59 games, the 1972 featured the newly-acquired Steve Carlton and not much else. Schmidt, like the Phillies themselves, would struggle, often mightily, in his first two years in the Majors. Schmidt would hit just .197/.324/.367 in his first 483 PA across 1972 and 1973. The Phillies stuck with the Ohio native and were rewarded mightily in 1974: Schmidt would lead the league in strikeouts while also leading the Majors in homers and the NL in slugging. Schmidt earned his first of 12 NL All-Star selections in 1974, posting a triple-slash line of .282/.395/.546. Often, even in retrospect, it is hard to recognize just how great Schmidt was due to a number of factors. When the Phillies reached the postseason for the first time since 1950 in 1976, Schmidt once again led the Majors in homers but fell behind teammate Greg Luzinski in MVP voting. When Schmidt won his first of an NL-record-for-third-baseman ten Gold Gloves in 1976, the memory of slick fielding teammate Larry Bowa was still fresh in the fans minds. When Schmidt blossomed, the team blossomed, but he was better than the rest. 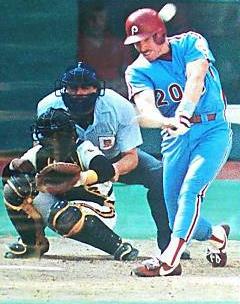 Schmidt asserted this in 1980, hitting a then-club-record, and Major League-leading, 48 homers, while leading the NL in SLG% and OPS, en route to his first of three NL MVPs, carrying the Phillies back into the playoffs after a one-year hiatus. Schmidt would lead the Phillies to the first World Series’ title in club history after hitting .381/.462/.714 against the Kansas City Royals. Schmidt was named the World Series MVP. Schmidt’s all-time marks are legendary: ranked 15th by FanGraphs and 19th by Baseball Reference in their respective WARs, Schmidt ranks 15th all-time in HR and 35th in RBI, while leading all third baseman in those categories as well as slugging. Schmidt ranks as the all-time Phillies leader in games played, PA, HR, hits, runs, RBI, BB, IBB, and FanGraphs’ defensive runs saved. Schmidt was among baseball’s greatest and that point is reflected in other spots in the Phillies’ leaderboards, including his, somewhat surprising, ranking of at 15th in steals. From 1972 through 1989, FanGraphs’ indicates he was the best player of his time by their version of WAR, leading baseball in HR, runs, and RBI, ranking fourth in SLG%, 12th in FanGraphs’ version of defensive runs saved, and 14th in hits. Schmidt’s number 20 was retired in 1990 and Schmidt was inducted on to the Phillies’ Wall of Fame the same year. Schmidt was inducted as a first-ballot choice to the Baseball Hall of Fame in 1995 alongside Richie Ashburn. Schmidt is considered the greatest third baseman of all-time in the Baseball Historical Abstract by Bill James and is the definitive number one choice for the Greatest Phillie of All-Time.